MINERSVILLE, PA – With a full field of cars in the pits last Friday, promoter Jake Smulley was once again forced to cancel the night’s show due to the rain just as the cars were about to hit the track for warmups. With the forecast not looking like it was going to clear anytime soon, the track had no choice but to cancel the balance of the night’s activities. 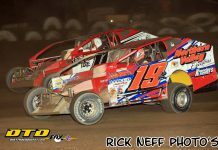 Big Diamond will try it once again this Friday night August 4th when the track presents the “Hunt the Giant” night with the headline race belonging to the highly competitive U.S.S. Achey Sportsman division. The Sportsman will compete in the 30 lap Fayash Memorial Race with a cool $1750.00 going to the winner. Current U.S.S. 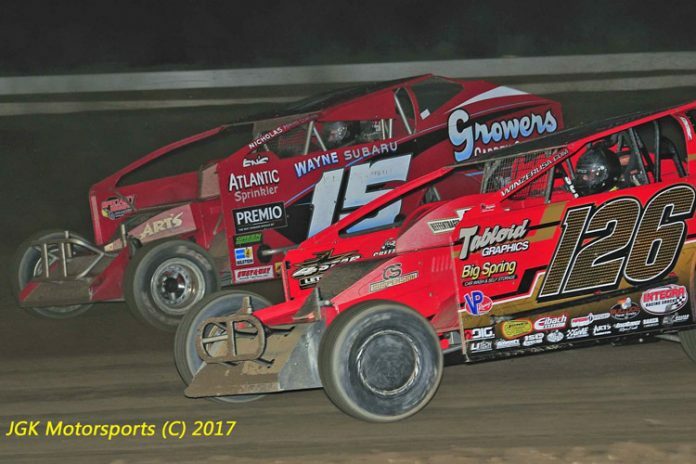 Achey Sportsman points leader Matt Stangle will be looking to grab the big prize and put some distance between himself and the rest of the field as he shoots for his first ever Big Diamond title. The Steel and Metal Services Modified division will also be back in action this Friday as points leader Craig Von Dohren looks to increase his points lead over longtime rival Jeff Strunk. 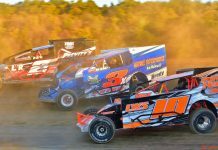 The season is winding down quickly and the cars and stars of the Big Diamond Modified division are all looking ahead to the season ending “Jack Rich” Coalcracker 72 lap feature and trying to get their cars tightened up and going fast looking for the big $10,000 first place prize that goes to the winner. The Savage 61 Road Runner division is also on the card for the Friday night as points leader Kody Sites continues his chase for the points title. The No Sweat Service Street Stock division will be taking the week off. The division’s “Street Stock Summer Shootout” will be rescheduled for Friday September 1st with a rain date of Sunday September 3rd. Not only will there be plenty of action on the track, but there will be plenty of action and activities going for the fans as well. The track will have *Free Ice Cream (while supplies last), *Live Music, *Free Popcorn, *Giveaways and a *Kids contest for victory lane. General admission for the night is $18, with kids 12 and under free. As always, active military with ID are free.